Job burnout or career burnout can push some people to retire early - and that usually isn't the right course of action. Do you want to retire because you don’t like work? Or do you want to retire because you don’t like the work you’re doing? Job burnout and career burnout happen to almost everyone at some point, but when retirement is on the horizon, it’s easier to feel burnt out. As the Retirement Answer Man, I can tell you that many of my clients are just plain sick of doing what they’ve done their whole lives. Sadly, sometimes that pushes them to make poor decisions about retirement. Most people think about retirement as a way to run away from work – to escape pain. Running away doesn’t fix the real issue unless you’re running toward something with more purpose. According to the Federal Reserve, a third of men who retire later re-enter the labor force. Not only that, but after getting back to work, they feel much less stressed while working than before they retired. Also, about 11.9 percent of men identify “work burnout” as the reason they retire. Let me tell you what that means, to me: You don’t retire because you don’t like work. You retire because you don’t like the work you’re doing. Beyond that, I think too many people are fully retiring when they shouldn’t be simply because they’re doing the wrong kind of work before they retire. I started my career as an advisor during the early 90s – I learned to trade technology stocks for clients. It was fun for a while but soon, I burnt out. Although the money was good my soul was empty. It wasn’t who I was or where I wanted to go. I joined a major financial firm. The transition helped me learn the craft of advising clients and feel a little better. I soon recognized, though, that the structure there wouldn’t support my goals either. Advising clients was as much about serving the firm as it was the clients. And I moved on again. You can think of each of these career changes as my retirements. It’s been a long time since I could say I was deeply burned out because I set the rules now and can take active steps to fight burnout when I see it. A while back, I talked to Dr. Clark Gaither on my podcast. Most people just refer to him as Dr. Burnout. Clark was intensely sick of being a practicing physician. His job burnout accrued over time as regulations and working conditions deteriorated to the point he felt he was violating his oaths to even show up at work. 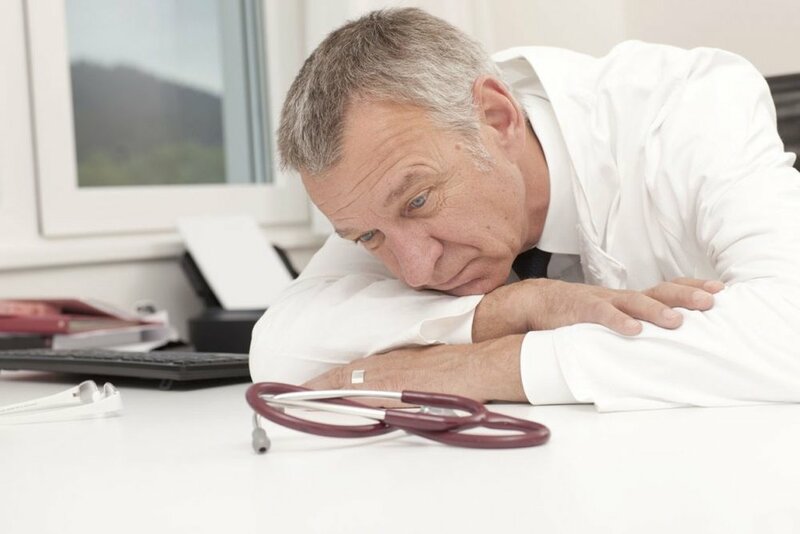 The tactics helped, but he still retired from being a physician earlier this year and transitioned to being a coach for doctors who struggled with the same symptoms of job burnout that he had. Here’s the problem: Gallup says people are retiring later than ever. In the span of 12 years between 2002 and 2014, people began retiring three years later. Unless you have something meaningful planned to replace your career when you retire. If you’re running away from pain, you need something meaningful in front of you to run toward. And it can’t be golf. That loses meaning pretty quickly. The first step to correcting any problem is recognizing it. Dr. Burnout didn’t recognize his symptoms as burnout. He just gradually stopped caring about work. Same thing happened to me in my former careers because I just didn’t fit. In Clark’s research after he stopped allowing himself to stay burned out, he found the symptoms of job burnout and recognized them in himself. Depersonalization: Because of intense cynicism at work, clients, coworkers, and other people stop being quite so human. Maybe you feel like people with problems deserve what they get. Not a good position to be in as a doctor, financial planner, or anything else. Loss of a sense of personal accomplishment: You don’t feel like you’re making a difference anymore with your work. You start to negatively self-evaluate and you feel even less accomplished. Clark told me that men and women hit these symptoms a little differently. Women tend to pick up the symptoms in order. On the other hand, men often experience depersonalization first, then emotional exhaustion. They often don’t quite make it to losing a sense of accomplishment even when they are burned out. So if you’re emotionally exhausted as a woman, that’s the first symptom of work burnout. And if you’re a man, cynicism and a lack of empathy are the first signs of career burnout. You know what to look for now. Great! But what caused you to get to that point? After all, prevention is always preferable to the cure. A psychologist by the name of Christana Maslach figured out the six primary causes of job-related burnout in 1981. Any of those look familiar to you this late in your career? Of course they do! The more experience you have, the more valuable you are and the more work overload you tend to receive. That kicks your ability to control things while making sure the hours you put in aren’t rewarded enough, yada, yada, yada. If you’re familiar with any of the causes of job burnout and looking to retire, you’ve got to make some tough decisions. For Clark, it meant a change of career late in the game. For me, I made the decision to start living and working like I’m retired now while planning to work later into my life. That way I have the refueling feeling of retirement while still chasing the meaning of helping people through my work. If you feel burned out from your work and would rather retire than go on, follow these steps for me. And for you. Identify the symptoms of job-related burnout. Make sure you identify with each of the three symptoms. (Or at least the top two if you’re a man.) Score yourself from 1-10 on each of the symptoms and write a short paragraph about how you feel because of them. Burnt out?Go on to the next step. Find out why you’re burned out. Burnout creeps up on you. You don’t start one day completely fine and the next day you can’t stand your work. So figure out which of the six causes of job burnout put out your fire. Again, rank yourself from 1-10 in each of the six categories. Change the rules. Once you identify the major causes of your burnout, you need to figure out if or how you could change them. Work with your boss (if you have one) to reverse the problems. If you’re the boss, you may really have to change the rules. That may mean a career change, hiring more employees to offload some work, starting a different business, or otherwise mixing things up. Simple retirement may not be the answer, especially if you’re not independently wealthy. Keep the meaning in your life. Whether burnout pushes you to retire, start a new business, change the rules where you work, or otherwise take action, know that you need meaning in your life wherever you end up. If you don’t keep meaning in your life, you may just find you’re one of those retirees who starts working again just to reignite the meaning in their life. Remember, you’re not running away from being burnt out, you’re running toward something with more meaning. Being burnt out and sick of work means you’re sick of what you’re doing, not sick of work. That’s why I recommend to my clients to keep meaningful work in their lives. What’s your plan for keeping retirement meaningful?